This mac and cheese is truly the best I’ve ever had! And David too. And I bet you too. It is just so good, you have to try it!! First, pre-heat your oven to 400ºF. Then boil a pot of water and cook 1 pound of pasta, al dente, according to the package’s instructions. These measurements serve four to five people as main courses, so you can adjust this recipe depending on how many people you are feeding. But leftovers are delicious, so don’t be afraid to make more than you need! 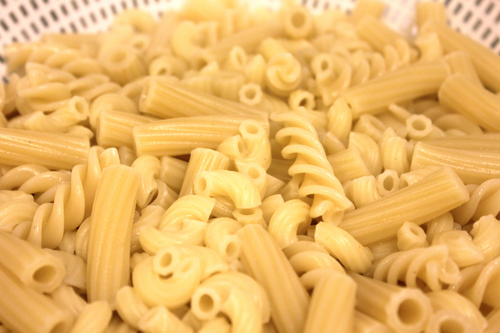 As for the noodles, macaroni or other ridged pastas work best because they hold the cheese easier. 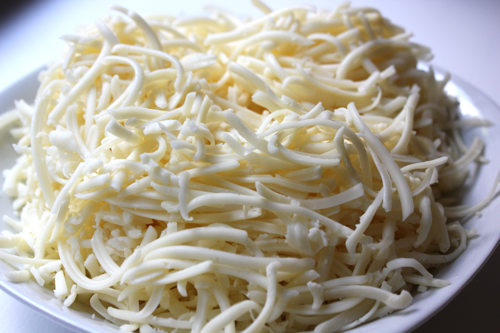 While your pasta is cooking, grate 2 cups of cheese. I love gruyère cheese, but a mix of gruyère and cheddar is absolutely delicious. It helps to use a food processor’s grating attachment to make this step easy breezy. Also grate 1/2 cup of parmesan cheese. Drain your pasta after it cooks, and set it aside. 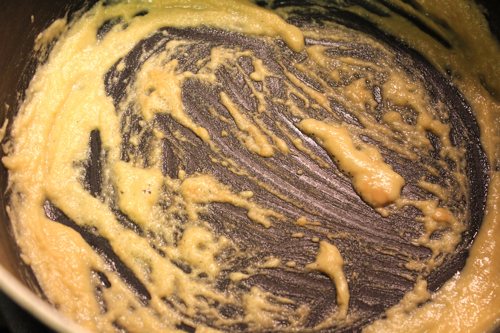 Then, melt 3 tablespoons of butter or margarine in the same pot (to save on dishes) until it bubbles. 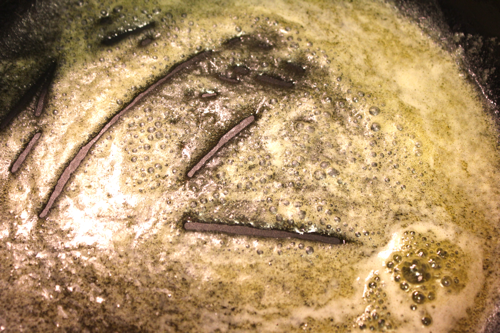 Add 3 tablespoons of flour, and whisk it into the butter until it browns. This is called a roux. 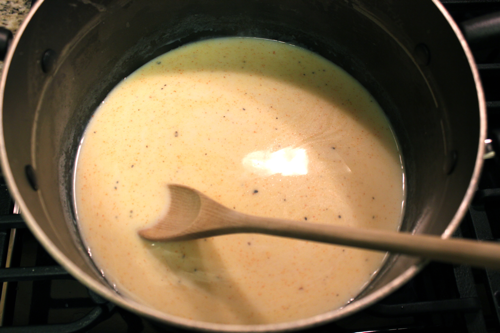 After the roux browns, add 2 1/2 cups of milk along with salt, pepper, and cayenne pepper to taste. Don’t skip the cayenne unless you absolutely hate spice because it makes the mac and cheese so much more interesting to eat. Whisk or stir it constantly until the milk thickens. You will know the milk is thick when your spoon starts leaving tracks in it. Then, mix in most of your grated gruyère and cheddar cheese, reserving at least 1/2 cup to sprinkle over the top of your mac and cheese. 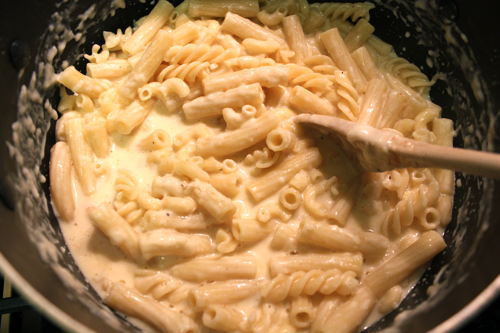 Once the cheese melts into the milk, remove the pot from the heat and mix in your pasta. 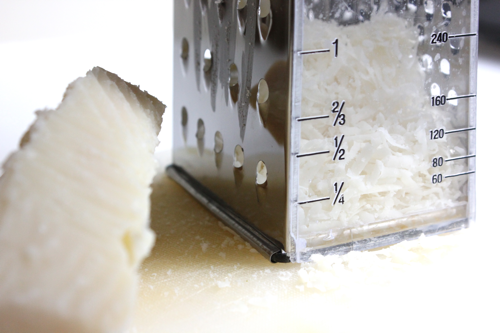 Then mix the grated parmesan cheese into the pasta. 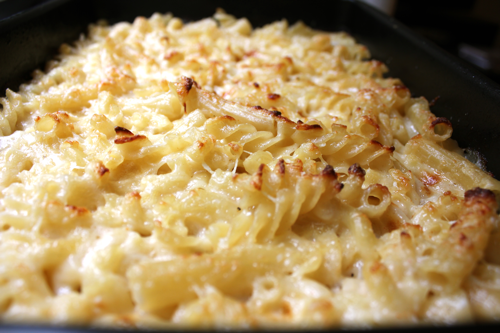 Pour the pasta into a baking pan or individual ramekins and sprinkle the remaining cheese over the top. Put the pan into the oven for 15-20 minutes. If your mac and cheese isn’t brown enough after this time, put it under the broiler to help form a nice crust. You don’t need breadcrumbs when you have a nice cheesy crust! Much better! 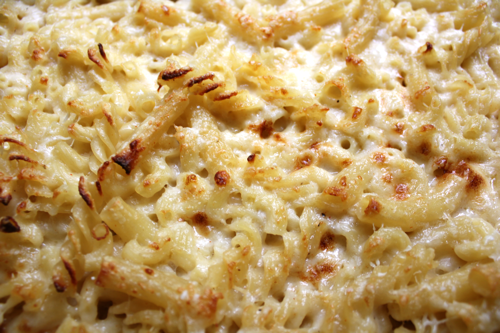 This recipe was adapted from Mark Bittman’s baked mac and cheese in How to Cook Everything. Side note- I apologize if this post made less sense than normal; I’m coming from one of the funnest nights and I’m all out of coconut water. There were dirty martinis, the best pork chop I’ve ever had (hopefully to make an appearance here soon), and even better company. Oh, balsamic berries over brownies too! I love dirty martinis! Ok, that was a bit random. I also love this recipe and how you mixed pasta shapes. Hey, it’s the little things. Wow I love Mac and Cheese- will have to try this combo! Much better than the crap out of a box eh? 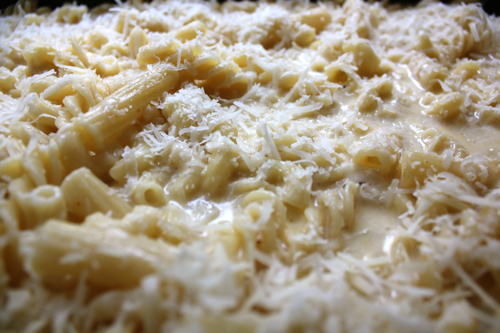 I love the various types of pasta you used – I never would have thought to do that! Clever Clever! Wow that mac and cheese looks so good. World’s best mac n cheese? Sure wish you would adapt these recipes so we could print them out. Would make me smile! If you click the print button under each post, you can eliminate photos and text before printing. you said to use a pound of pasta, can you please put that in cups? The number of cups will vary based on the size and shape of pasta you use. At least in the US, pasta is generally sold in 1 pound bags or boxes.